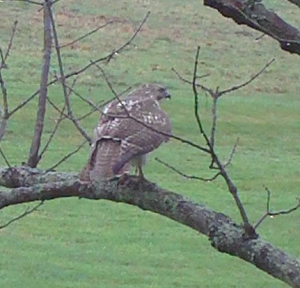 This red-tailed red hawk was right outside my bedroom window this morning. We are used to seeing them soaring high over the field but this one caught us by surprise 12 feet from the house. 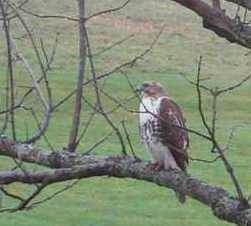 The red-tailed hawk is anywhere from 19-26 inches long and has a wingspan of 4 1/2 feet. 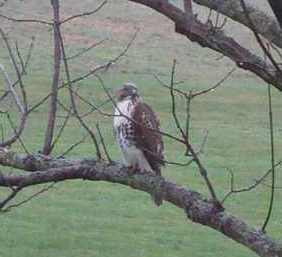 This hawk is usually found near farmlands, open woodlands, plains and deserts. The red-tailed hawk soars in circles over open farmland looking for voles, field mice and other mammals. 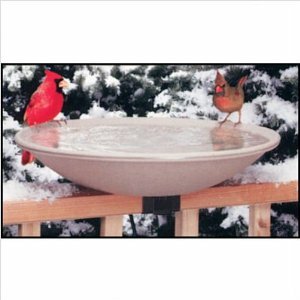 To find out more about bird watching books click here.